Ernest Cline’s debut novel, Ready Player One, was a kaleidoscopic smorgasbord of 1980s pop culture slammed into the virtual world of a massively multiplayer online role-playing game (MMORPG) that existed in Cline’s nightmarish, post-apocalyptic vision of the 21st century. In a single scene, the main character shows up at a (virtual) party in a tricked-out DeLorean he won in a Back to the Future quest on the planet Zemeckis. The DeLorean sports an onboard computer named KITT (Knight Rider) and Ghostbuster stickers on its gullwing doors. Once inside the party, he orders a pan-galactic gargle blaster (Hitchhiker’s Guide to the Galaxy) and dances to 1980s grooves mixed by the DJ, R2-D2. Yes, Ready Player One was some uber-geekery, but in finding an audience Cline cast a large net. It wasn’t just the 20-sided dice rollers and the joystick jockeys – no. Readers who loved Star Wars, read William Gibson or Douglas Adams, listened to Rush, or quoted lines from The Breakfast Club fell under Cline’s spell. It was good stuff and, despite the novel being one ginormous mash-up, it was original and it was entertaining. 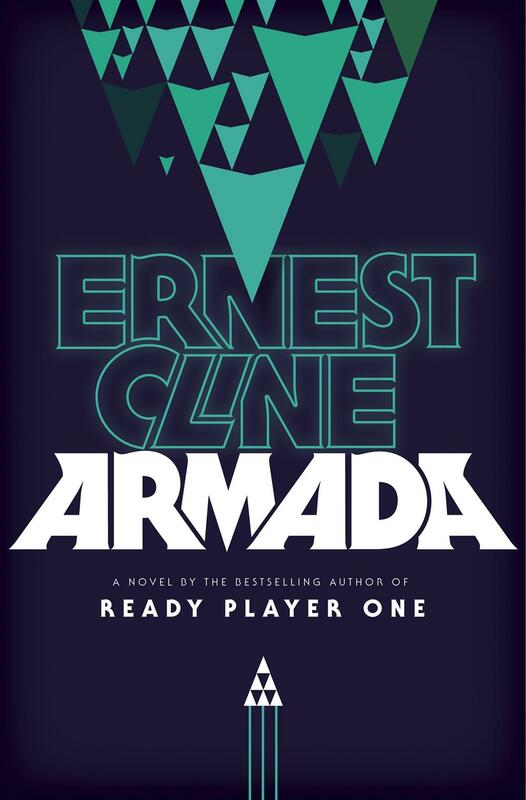 Now, four years later, Cline’s cult following is clamoring for his next book: Armada. 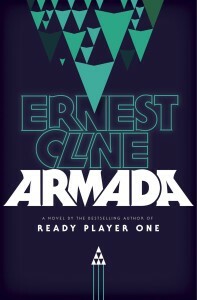 Out in July, Armada is the story of Zack Lightman, a teenage gamer who learns that all of the hours he has spent playing the eponymous game has actually been training for the ultimate challenge – to save the Earth from invading aliens (“See ma, I told you I wasn’t wasting my time.”). Sound familiar? It should. The premise is identical to that of The Last Starfighter (1984), in which a trailer park kid learns that his favorite arcade game, Starfighter, has been an exercise to prepare him for an alien war. It’s also a premise that arises in Ender’s Game, as well as in a new movie called Pixels, starring Adam Sandler and Peter Dinklage, except that in Pixels, the Earth is under attack from actual video games – PacMan, Donkey Kong, etc. – a twist likely to make that movie more interesting than Armada. Because frankly, Armada is not all that interesting. The novel opens with the sudden appearance of an alien spacecraft outside the window of a Beaverton, Oregon high school, where our hero, Zack, is the only witness. Cline really packs the science fiction mentions into these opening pages – Time Bandits, The Hitchhiker’s Guide to the Galaxy, and Star Wars all within a few sentences. Please pass the blue milk, Aunt Beru. It’s all very nudge-nudge, wink-wink, with Zack making these oblique references to everything from Viking mythology to Star Trek, and all points between. As it happens, the aliens do exist, and Zack, Armada expert that he is, is whisked off to the top secret Earth Defense Alliance base in Nebraska, where he meets a nice girl with Alien and Tank Girl tattoos and a chrome hip flask painted to look like R2-D2. Things move fast from here, and by fast I mean that over the course of the next 24 hours, Zack fights the Alien horde, is relocated to “Moon Base Alpha,” meets his heretofore presumed-dead father (Whoops! Spoiler alert… really? ), and together they save humanity from certain doom, earning the respect of an intergalactic peace alliance and meeting Stephen Hawking and Neil deGrasse Tyson (a thinly-veiled version of whom also appears in Neal Stephenson’s Seveneves) in the process. Armada is ultimately disappointing. The plot is paper-thin, and it buckles and sinks under the weight of all the aforementioned pop culture easter eggs, which turn out to be the best part of the book. The writing is mediocre at best, the characters are one-dimensional, and the ending is eye-rollingly ridiculous. Save yourself a few Altarian dollars and forgo this one. Better yet, if you want to enjoy a smart and funny science fiction novel, you need look no further than Charles Yu’s How to Live Safely in a Science Fictional Universe, one of my favorites from the past five years. I’d love to hear yours in the comments.